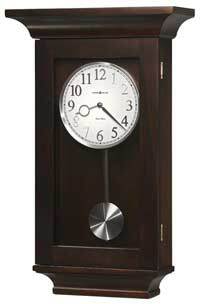 This special 82nd Anniversary Edition wall clock features a white dial with black Roman numerals and a brushed nickel bezel and black hour and minute hands. A spun nickel pendulum bob is suspended on a Black Satin finished wood stick in front of a mirrored back. Finished in Black Satin on select materials, hardwoods and veneers. Hinged front door opens with dial attached to allow easy back access to the movement and batteries. Quartz, triple chime Harmonic movement plays your choice of Westminster, Ave Maria, or Bim Bam chimes with volume control and automatic nighttime chime shut-off option. 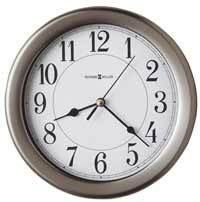 Westminster Chime may be switched to quarter hour or hourly only melodies. 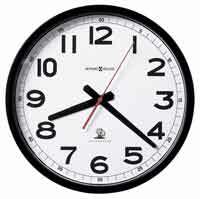 Clocks for sale at The Clock Depot including the 625-440 at discount prices.